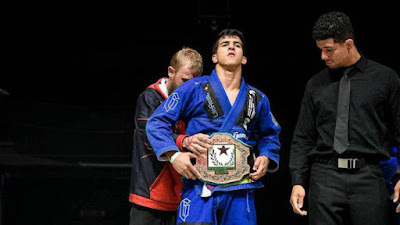 Undefeated as a brown belt, 20-year-old Matheus Gabriel of Checkmat is aiming to hold more Fight To Win Pro title belts that anybody before. He holds three F2W title belts in three different divisions: he won the 155lb gi purple belt title and holds the 145lb brown belt titles both gi and no-gi. On Friday, March 2nd, Gabriel will dispute the 155lb brown belt gi title in a submission-only match against Joseph Tonche making him the only athlete to potentially hold four F2W title belts in different divisions. The hyper-talented youngster has had 20 matches since being promoted to brown belt with 15 submissions. As a purple belt, he had a total of 102 matches – 96 wins, 76 by submission.